Windy conditions are bringing showers, snow and sending bushfires out of control. SEVERE weather warnings are in place for three states as gale force winds batter parts of the country. Homes in NSW are also under threat from a bushfire that is out of control. A strong cold front heading in from Western Australia has already delivered winds in excess of 100km/h to parts of Victoria, Tasmania and NSW. 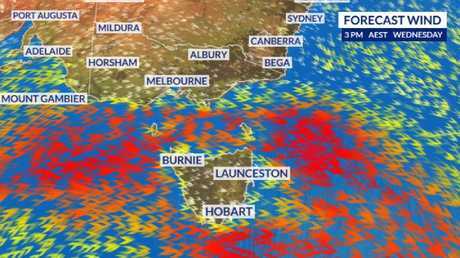 Thousands of homes in Tasmania have been left without power after a night of wild gusts up to a peak of 163km/h. "There will be showers and gale force winds across the southern coastline of Australia today. It's a very wintry day across southeast Australia" Sky News Weather meteorologist Tom Saunders said. "For NSW the winds have picked up overnight for southern parts of the state." A severe weather warning covers much of NSW including Wollongong, Goulburn, the Blue Mountains and Snowy Mountains. Sydney and Canberra are close to, but just outside, the warning area for the worst gusts. "Vigorous west to north-westerly winds are being generated ahead of a cold front that is moving through the southeast later today and overnight," the BOM said on Wednesday. For Alpine areas above 1900m, peak gusts in excess of 120km/h are possible today with "blowing snow" expected and blizzards a possibility. The National Parks Service of NSW recommends that people consider postponing back country travel until conditions improve. For areas below 1900m, gusts in excess of 90km/h are likely, particularly in the early afternoon. In Victoria, the coastline will also see 90km/h gusts today including Geelong and some southeastern parts of Melbourne. On Wednesday morning, gusts of 115km/h were recorded at Wilsons Promontory, 111km/h at Mt William and 98km/h at Yarram. 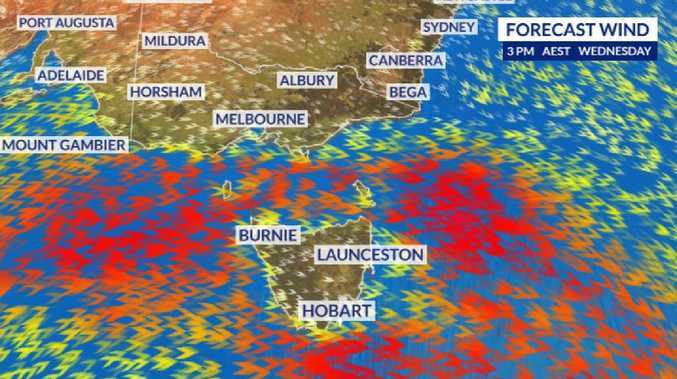 Almost all of Tasmania is also in the firing line with winds averaging 60-70km/h and peak gusts of around 100km/h continuing into the afternoon. Thunderstorms are possible about the north and west coasts. Some elevated and exposed coastal weather stations have reported gusts in excess of 130km/h over the past 12 hours, with the highest gust being 163km/h at Maatsuyker Island. The winds have whipped up an out-of-control bushfire which is threatening homes on the NSW South Coast. Properties west of Burrill Lake, a small village south of Ulladulla, are under threat and residents are being told it's too late to leave, the NSW Rural Fire Service says. "Residents in the area of Kingspoint and areas west of Burrill Lake and Ulladulla are advised to seek shelter in a solid structure as the fire impacts," the RFS said on Wednesday morning. The fire - about 100 hectares in size - is being fanned by very strong north-westerly winds, with gusts of up to 60km/h. "Under these conditions, fires are uncontrollable, unpredictable and fast-moving." A grass fire was also burning out of control in Jerrara, west of Kiama. The RFS said the fire was burning "close to properties" but crews were on scene to try to protect them. Commissioner Shane Fitzsimmons said the activity was extremely concerning. "Escaped fires pose a very real and potentially deadly threat to the public, especially if that escaped burn takes hold and fire authorities are not notified," he said.